When the mirror is a part of a sphere, it is called spherical mirror. Spherical mirrors are of two types. In concave mirror, the reflective surface is inside the sphere, i.e. is depressed. In convex mirror, the reflective surface is outside the sphere, i.e. is bulged or protruded. 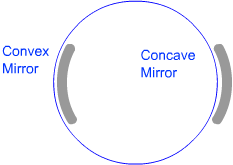 Image formation in Concave Mirror: In case of concave mirror, the image is usually inverted, real and smaller than the object. When the object is kept too close to the concave mirror, the image is erect, virtual and larger than the object. Concave mirror is used by dentists and ENT specialists to focus a beam of light to see inside a patient’s mouth or ears. Concave mirror is used in solar furnace, because rays of sunlight converge at a point once they reflect from the concave mirror. Concave mirror is used as barber’s mirror, because it shows a larger image when object is too close. Image formation in Convex Mirror: In case of convex mirror, the image is erect, virtual and smaller than the object. Convex mirror is used in rear view mirrors, as it shows smaller images from a bigger field of view. Convex mirror is used on hairpin bends, to see the vehicles coming from other side of the bend. Which type of image is usually formed in case of concave mirror? Which type of image is formed in case of convex mirror? Lens is made of two transparent surfaces in which at least one surface is curved. Convex and concave lenses in which both surfaces are either convex or concave are the most common types. Image formation in Convex Lens: In case of convex lens, the image is usually inverted, real and smaller than the object. When the object is kept too close to the convex lens, the image is erect, virtual and larger than the object. Image formation Concave Lens: In case of concave lens, the image is erect, virtual and smaller than the object. Uses of Lens: Convex lens is used in microscope, telescope and camera. Convex lens is also used in reading glasses. Concave lens is used in spectacles. The white light, or visible spectrum, is composed of seven colours. These colours are VIBGYOR (Violet, Indigo, Blue, Green, Yellow, Orange and Red). When white light passes through a prism, it breaks down into its component colours. This is the reason rainbows show all the colours of the visible spectrum. Newton’s Disc: Since Newton was the first to make this; it is called Newton’s Disc. 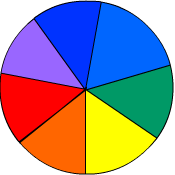 It is a circular disc on which seven colours of the rainbow are painted on seven different sectors. When the disc is rotated at certain speeds, it appears to be white. This shows, how the seven colours make the white light. How many colours are there in the visible spectrum? Which type of lens is used in a camera?